He made his way down the stairs from the first level of the parking garage, his cane in one hand and the cold metal railing in the other. A loudmouthed mix of mostly millennials ran past him halting his downward progress. He waited until the joyful group exited the stairwell and then continued his slow and steady progress. He reached the hospital entrance not unlike that tortoise who kept saying to himself 'slow and steady wins the race'. He knew he had the slow part down. The cane helped with the steady. But then he was in no hurry. His chemo appointment wasn't for another twenty-five minutes. He stopped and quickly queued at Second Cup and ordered a medium, then shuffled to the counter where they kept the milk and sweetener. He stirred his coffee, popped a lid on top and made his way to the elevators. Back out in the main area he was amazed at the number of people rushing to and fro moving much faster than he was capable of. And he marvelled at the number of people who virtually ignored the man with a cane. There were those who refused to walk on the right causing him to go around them. Then there were others who,waiting for the elevator, rushed on ahead of him. 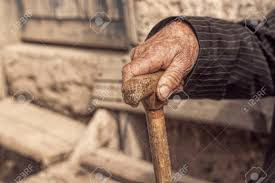 And he thought to himself 'hey, man walking with a cane here! Give a guy a break'. Funny, he thought, how the older he got the more laid back he got. He was only slightly perturbed by the vociferous, thoughtless people around him. And then he laughed to himself because he knew there was a time, long ago, when he would have probably been one to act that way too. Tara's Two Word Tuesday prompt is vociferous/loudmouthed this week. It's been some time since I've spoken that way.